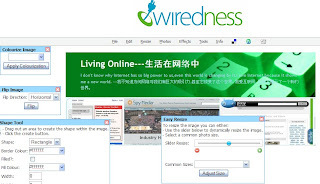 Wiredness is a new online photo editor by ajax. As other web-based photo editor, you can upload or link a photo from a web address, change size, add text, make effects. It is really cool that after you edit your photo almost you can see the result at same time. Now, it just supports PNG, GIF, JPEG and BMP, 5MB Maximum file size.